The 75–WF has been replaced by the new 75–WB and we recommend the 75–WB for all new customers. The 75-WB provide additional capabilities at the same price – click here for the 75-WB. There are limited quantities of the 75-WF still available. If you are still interested in purchasing this model, please call us at 1-800-956-4437 or email us at sales@dataloggerinc.com for pricing and delivery information. 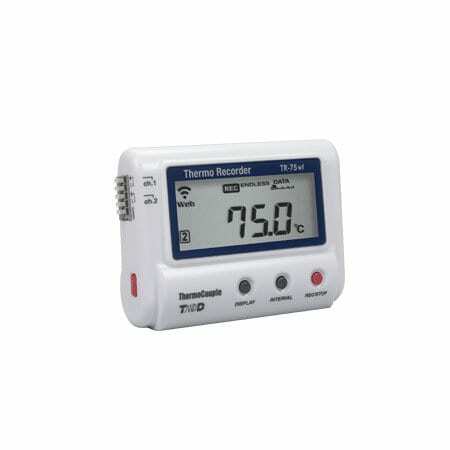 The TR-75wf WiFi Temperature Data Logger is a two-channel model for thermocouple sensors. 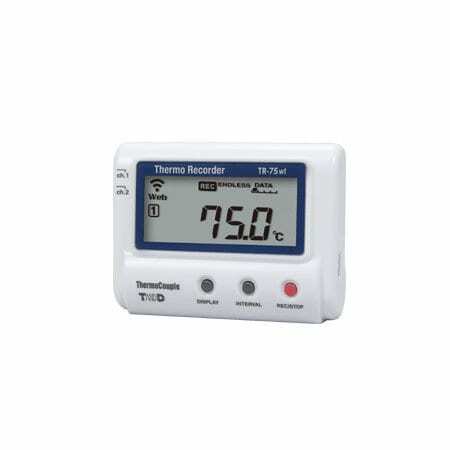 In addition to the standard features such as battery operation and USB communication, the TR-75wf supports communication with mobile devices. By using T&D’s WebStorage Service, users can access stored data anytime from the cloud. By using a wireless LAN, data is automatically uploaded to the WebStorage Service (registration required). The service can be used with mobile devices such as smart phones and tablets allowing users to monitor current readings, alerts and downloading of data. The Thermo application must be downloaded and installed on any mobile device. Data can also be downloaded to a PC with a USB communication cable (sold separately). View the TR-75wf/nw Product Brochure (PDF) or the TR-7wf/nw Series Overview Video.